Dimensions: 5-3/4" x 3-1/4" x 8-3/8"
Navy, Medium Kraft Recycled Shopping Bags, 8" x 4-1/2" x 10-1/4"
Dimensions: 8" x 4-1/2" x 10-1/4"
Navy, Large Kraft Recycled Shopping Bags, 16" x 6" x 12"
Dimensions: 16" x 6" x 19-1/4"
Queen bags have 200 per case. 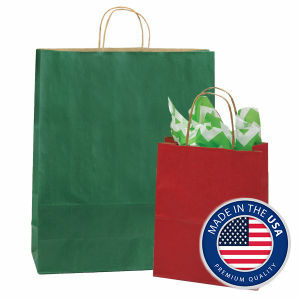 Made in U.S.A.
Order bags by the case. Case sizes are listed below.